Using keyboard shortcuts can greatly increase your productivity, reduce repetitive strain, and help keep you focused. For example, to copy text, you can highlight text and press the Ctrl+C shortcut. The shortcut is faster than moving your hands from the keyboard, highlighting with the mouse, choosing copy from the file menu, and then returning to the keyboard. Below are the top 10 keyboard shortcuts we recommend everyone memorize and use. Both the Ctrl+V and Shift+Insert will paste the text or object that’s stored in the clipboard. Use the above text input fields to highlight the “Cut or copy this text” text and press either Ctrl+C to copy or Ctrl+X to Cut the text. Once Cut Move to the next field and press Ctrl+V or Shift+Insert to paste the text. For further demonstration, visit the following link. Pressing Ctrl+Z will undo any change. For example, if you cut text, pressing this key combination will undo the cut. These shortcuts can also be pressed multiple times to undo or redo multiple changes. Pressing Ctrl+Y would redo the undo. On Apple computers, use Cmd+Z and Cmd+Y to undo and redo. Use the above text input field to highlight some or all of the text and then press Ctrl+X to cut the text. Once the text has disappeared press the Ctrl+Z to undo the cut. Tip: If you did the first example as well (cut and paste text) and you continue to press Ctrl+Z, it is also going to undo that change. Pressing Ctrl+F opens the Find field, which allows you to search the text currently displayed in any program that supports it. For example, Ctrl+F can be used in your Internet browser to find text on the current page. Press Ctrl+F now to open the Find in your browser and search for “shortcut” to display each time shortcut is mentioned on this page. On Apple computers, use Cmd+F to find. Pressing Alt+Tab switches between open programs moving forward. For example, if you have your browser window open and other programs running in the background press and hold Alt and then press the tab key to cycle through each open program. On Apple computers instead of using the Alt key use the Command (Cmd) key. For Example, Cmd+Tab to switch between open programs. Bonus Tip: Press Ctrl+Tab to switch between tabs in a program. For example, if you have multiple tabs open in your Internet browser, press Ctrl+Tab to switch between them. Bonus Tip: Adding the Shift key to Alt+Tab or Ctrl+Tab moves backward. For example, if you are pressing Alt+Tab and pass the program you want to use, press Alt+Shift+Tab to move back to that program. Bonus Tip: Windows Vista, 7, 8, and 10 users can also press the Windows Key+Tab to switch through open programs in a full screenshot of the window. Note: The following shortcuts are for PC users only and do not work on Apple computers. Pressing Ctrl+Backspace will delete a full word at a time instead of a single character. Holding down the Ctrl key while pressing the left or right arrow will move the cursor one word at a time instead of one character at a time. 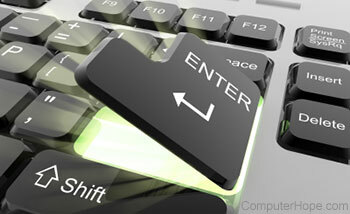 If you want to highlight one word at a time, hold down Ctrl+Shift, then press the left or right arrow key. Your highlighted selection will move one word at a time in that direction. While working on a document or other file in almost every program, pressing Ctrl+Ssaves that file. Use this shortcut key frequently if you’re working on anything important in case an error happens, you lose power, or any other issues that could cause you to any work since the last save. On Apple computers, use Cmd+S to save a file. Ctrl+Home will move the cursor to the beginning of the document, and Ctrl+End will move the cursor to the end of a document. These shortcuts work with most documents, as well as web pages. On Apple computers use Command and the Cmd and the up arrow to get to the beginning of a document or text or Cmd and the down arrow to get to the end of a document or text. Control+P is used to open a print preview of the page or document currently being viewed. For example, press Ctrl+P now to view a print preview of this page. On Apple computers use Cmd+P to open the print preview. As you may have guessed, pressing either the page up or page down key will move to the next or previous page. When browsing the Internet, pressing the spacebar moves the scrollbar down a page. Similarly, Shift+spacebar moves the scrollbar up one page. The right to install the home/business version on pc and laptop for the same user, does not exist anymore like it has been with the 2010 version of office.